Anthony Bourdain suicide death: what led to the celebrity chef hanging himself? Home Scandal and Gossip Why? Celebrity CNN food host chef hangs self dead. Why? Celebrity CNN food host chef hangs self dead. Anthony Bourdain suicide death: what led to the celebrity chef hanging himself in a hotel room in Paris? Speculation mounts. Celebrity chef Anthony Bourdain has died after hanging himself. He was 61. Notice of the man’s suicide death was confirmed via CNN who told of the chef being discovered unresponsive at a Paris hotel room, at Le Chambard early Friday morning. Leading up to his death, Bourdain hosted the network’s travel food show and had been filming an upcoming episode in France. CNN told of Broudain’s close friend, Eric Ripert, owner of New York City’s famed Le Bernardin restaurant, finding him unresponsive in his hotel room Friday morning. ‘It is with extraordinary sadness we can confirm the death of our friend and colleague, Anthony Bourdain,’ the network said in a statement Friday morning. Bourdain rise to fame was highlighted by Bourdain’s memoir ‘Kitchen Confidential: Adventures in the Culinary Underbelly,’ which detailed his struggles with drug abuse. It remained unclear whether the celebrity chef had relapsed and started using drugs again, particularly cocaine and heroin which he conceded to having once been an avid user of. Upon walking away from his sordid past, the culinary chef with his writings soon became a household name as by now he began hosting such shows as ‘A Cook’s Tour’ and ‘No Reservations’. Asia Argento (@AsiaArgento) and Hugo Clement (@hugoclement) affair might have something to with Anthony Bourdain’s (@Bourdain) suicide. RIP. Anthony Bourdain suicide death: ‘The world is falling down, I am learning to live with it’. Bourdain was married twice, and leaves behind a Ariane, born in 2007. Most recently he was dating actress Asia Argento. Bourdain met Argento when they shot an episode of Parts Unknown in December of 2016, shortly after he broke up with his second wife, MMA fighter Ottavia Busia – the mother of his only child. Posted the actress on social media: ‘Anthony gave all of himself in everything that he did. His brilliant, fearless spirit touched and inspired so many, and his generosity knew no bounds. He was my love, my rock, my protector. I am beyond devastated. My thoughts are with his family. I would ask that you respect their privacy and mine’. Despite the pair seemingly being a happy match, there had been speculation whether Bourdain and Argento were still together. On Monday, Argento was pictured walking around Rome with journalist Hugo Clement. The two were photographed laughing and hugging. This was also just days after Bourdain bought a moody painting with the ominous title ‘The world is falling down, I am learning to live with it’. Anthony Bourdain suicide death: a second lease at life. Having put away his demons, the master chef and story teller went on over the years to win a variety of culinary awards. In the same year, CNN brought the maverick into the news network still best known for breaking news and headlines. 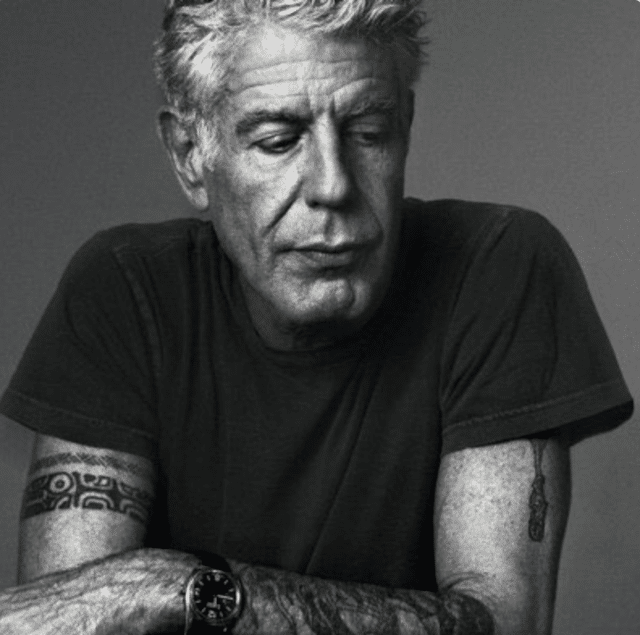 Bourdain quickly became one of the principal faces of the network and one of the linchpins of the prime time schedule. Season eleven of ‘Parts Unknown’ premiered on CNN last month. Bourdain’s suicide death comes three days after fashion designer Kate Spade hanged herself in an apparent suicide at her Manhattan apartment on Tuesday. Spade’s death is understood to likely have been prompted by her husband, Andy Spade demanding divorce and recently leaving the couple’s Park Ave residence. It remained unclear if there had been personal trauma or relationship issues at the time of Bourdain’s death or he had been dealing with depression…. Is he right? Val Kilmer calls Anthony Bourdain suicide death selfish. Anthony Bourdain girlfriend posts (& deletes) ‘FXCK YOU’ photo before celebrity chef suicide death announcement. Anthony Bourdain Sets fire to 6 tons of uncut Cocaine. Let the death of Kate Spade and Anthony Bourdain remind everyone that money nor fame can “cure” depression. It’s irrational, it’ll sweep off the rug under your feet. I admired & respected so much about Anthony Bourdain. But most of all, I loved that he had a fantastical second chance, that he seized it, he marveled it was bestowed upon him, & he shared & did good with it. He was living out an extended happy ending. Anthony Bourdain had one of the only shows on tv that tried with all its might to teach Americans not to be scared of other people.